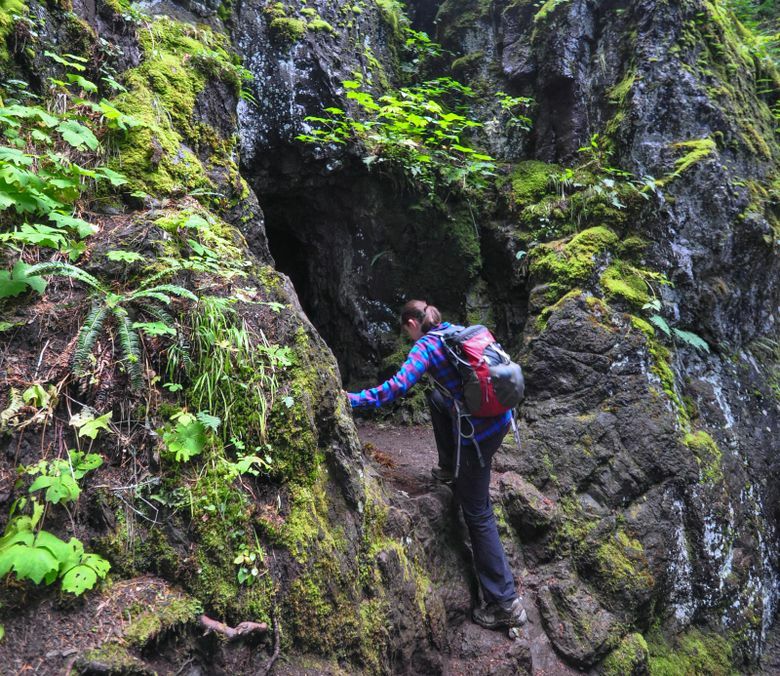 Hike to an old plane crash and spooky tunnels in Olympic Peninsula wilderness. In January 1952, a search-and-rescue B-17 was returning to McChord Air Force Base after assisting with a rescue mission in Canadian waters. Flying in blizzard-like conditions, the crew of eight was passing over the Olympic Mountains when their jumbo plane clipped a ridge and skidded down a steep, snowy slope. Three of the eight crew members were killed in the crash, and the survivors came to rest in a high mountain valley. They built emergency shelters until they were airlifted out the following day. 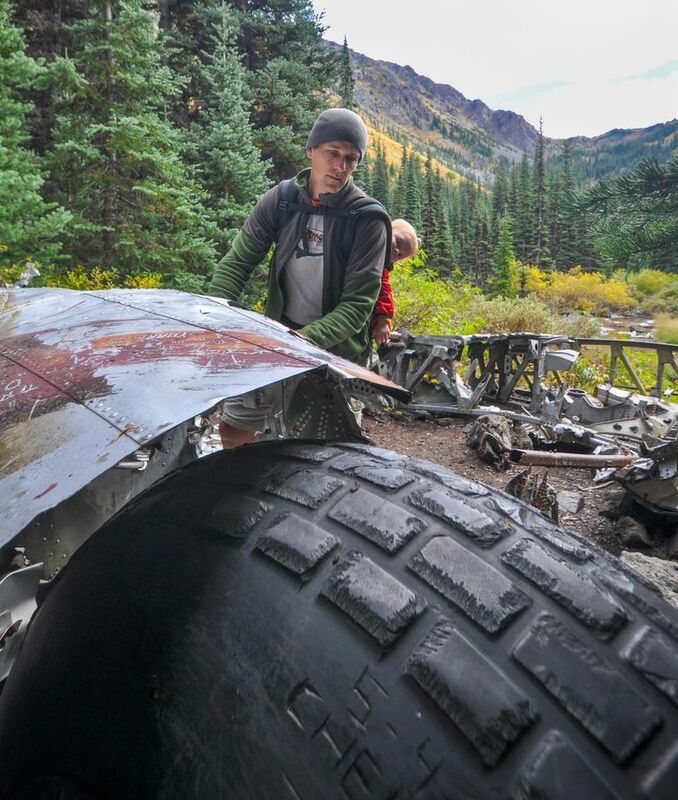 For more than six decades, wreckage of that plane has survived as one of the most unusual destinations for hikers in the Pacific Northwest — one that combines the region’s aviation history with a splendid mountain locale. Driving toward Sequim on Highway 101 from the Hood Canal area, go 1.5 miles past the 7 Cedars Casino at Blyn and turn left on Louella Road. In .9 miles, turn left on Palo Alto Road. Drive to the Y and take the right fork to Forest Service Road 2880. From here it’s 14 miles on unpaved roads. Stay on 2880 and follow signs past Dungeness Forks Campground and Dungeness Area Trails using FS Roads 2880, 2870 and 2860 to the Tubal Cain trailhead. No pass or permit required to park. Self register at the trailhead. There is a campsite and all-weather shelter near the parking area. A few scenic campsites are located near the B-17 crash site. 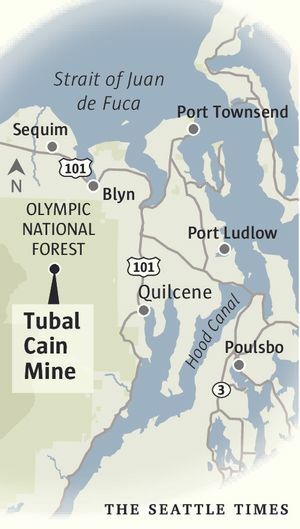 There are a good number of sites around Tubal Cain Mine, but be careful where you collect your water. Some of it travels through the mine and may contain pollutants. As an added bonus, the crash site is near an abandoned mine, featuring deep shafts and hulking, rusted machinery. With the right mindset, a visit to the two can be an eerie adventure in the spirit of Halloween — or simply a fascinating day trip or short overnighter. The journey to the crash site quickly enters the Olympic National Forest’s Buckhorn Wilderness. It’s a hike of 3.2 miles on easy, well-maintained trail. An uncommon sight surrounds you as you walk: great thickets of rhododendron that line the trail. Backing them are hemlocks jacketed with strands of lime-colored lichen that make terrific Dr. Seuss-style hipster mustaches. Mushrooms are prolific, from clusters of round puffballs to plate-like varieties, to those that look like coral transplanted from the ocean. The B-17 is found on a side trail called Tull Canyon. At the turnoff, your first encounter with a mineshaft awaits: a gaping hole in the side of the hill surrounded by dripping ferns — both inviting and creepy. The shaft travels only a few dozen yards and peeking inside is plenty of netherworld exploration for most — especially given the rockfalls that have occurred within the tunnel. The next .6-mile is very steep, but as you crest the hill, you enter an area that resembles a Zen garden, with a babbling stream cutting a path through vivid undergrowth. A glimmer of metal catches your eye, and moments later you’re standing before the remains of a huge airplane engine. That’s when you start to imagine the terrific force that scattered hundreds of pounds of metal into the woods. At the trail’s end, it’s hard to know what to look at first: the surrounding mountain peaks coated in fall reds and yellows, or the bones of the plane’s fuselage straddling the marshy valley floor. For an antique relic, there’s still a remarkable collection of debris remaining. The landing-gear wheels are the easiest to recognize, along with the hydraulic shafts that look as shiny as the day they were made. While the military removed some critical components and looters have taken their share, much of the aluminum frame and wings are ripe for investigation. As the B-17 careened down the snowy slope, pieces broke off, creating a dispersed debris field in the valley. But for the average visitor, the great mass of twisted metal around the main fuselage is enough to forge a deep respect for the harrowing events endured by the crew. Airplane enthusiasts and World War II buffs will want to spend hours trying to reconstruct which pieces belonged to what part of the plane. As I explored, I experienced conflicting emotions. Part of me felt solemn and respectful knowing that U.S. service members had perished at the site. Part of me was enthralled by the wreckage and its final resting place in a panoramic setting studded with peaks. Whenever I discovered some new part of the plane lying in the woods, I felt like I was on a treasure hunt. But no matter what feelings well up inside of you, I can promise that boredom won’t be one of them. After leaving the crash site and rejoining the main trail, walk another half-mile to see the relics of the Tubal Cain Mine: old pipes and unrecognizable mining equipment near the campground. A great hillside of mine tailings points the way to the main shaft. As you scramble up, you can see evidence of the purple manganese rock and greenish copper ore that miners were seeking in the early 1900s. The cavern appears suddenly at a crest. A stream exits from the opening, adding to the forsaken feeling of the site. The mine is still privately owned and unsafe for exploration, but the tunnel is reputed to extend nearly 3,000 feet into the mountain. Just sitting at the entrance knowing how deep it travels, feeling the cool breeze and smelling the hint of heavy metals from inside is enough to send shivers down your spine. Just in time for Halloween.